The British Model Soldier Society welcomes everyone interested in any aspect of model soldiers. We are a national society with members throughout the UK, but also welcome overseas members - the BMSS has members in 22 countries worldwide. The picture on the left shows some of the Area Reps and Commitee members. The British Model Soldier Society was founded on Saturday 6th July 1935 by a group of fifteen enthusiasts who met in a London restaurant. Originally called The British Society of Collectors of Model Soldiers, the name was changed in 1948 in order to reduce the number of words in the title without altering the scope. Monthly meetings were organised and new members joined. In October of 1935 the Society launched its own magazine, the Bulletin, which is still published regularly for members. An Annual Dinner was held and, after the 1936 dinner, competitions were organised. These expanded and developed into the BMSS Annual Show, attracting modellers from all parts of the United Kingdom. The popularity and prestige of the BMSS competitions set the pattern which has subsequently been followed by many organisations. The greatest threat to the Society's existence came with the outbreak of the Second World War. The BMSS had to contend with meetings interrupted by air raids, a much reduced Bulletin, and the shortage of lead soldiers, not to mention members being called into the armed services and sent all over the world. Despite these difficulties the Society survived and after the War resumed its regular activities. Membership grew rapidly, and in the 1950s meetings began to be held outside London resulting in the spread of BMSS branches all over the country. Through the years the Society's activities met with ever more success and continually increasing standards of modelling were seen at its meetings. Beginners learned new skills and techniques from more experienced members and in turn became master modellers themselves. Further growth brought the introduction of the Interbranch competitions, held annually between branches from all parts of the country, and the setting up of the BMSS National Collection. So to the present day, which finds the BMSS still thriving and expanding. As it has done throughout, the Society includes among its ranks painters and converters of all types of model figures, collectors of toy-style figures, scratchbuilders, and collectors of flats. The Society has an Information Service for members, and they also enjoy the chance to obtain items from the BMSS Support Services organisation, such as the Society's own specially commissioned range of model figures. There are local branches and Special Interest Groups, and the Society continues to publish the Bulletin magazine quarterly, a newsletter, the Bulletin Extra, and pages of the BMSS Handbook which build into a permanent reference work. Those first 15 members can have little imagined how their idea would grow over the years to the present day, but one can be sure that they would be pleased to see that the object of the BMSS, the promotion of the interest of military modelling in all its aspects, is still the keynote in all its activities. 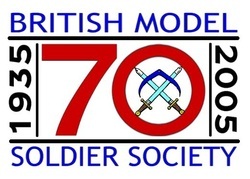 The British Model Soldier Society, the senior society of its kind in the world, is now over 75 years old and is proud of its record. But more than that, it is building on the solid foundation of its past and is looking to the future with vigour and enthusiasm, forever striving to help all its members to get the best out of this fascinating hobby.